At Carpentry Plus we offer a wide variety of carpentry solutions to meet your needs including; finish carpentry, custom built-ins, cabinetry, kitchen and bath remodels, room additions, floor installation and much more. "We can't say enough about the character of Rex Snyder at Carpentry Plus. Rex has values, honesty and dependability you can count on. He models generosity, integrity and excellence." "We are so happy to have found a truly honest carpenter who went above and beyond to meet our project goals. Carpentry Plus not only provided services to complete our project on time, but they offered solutions to help us complete our project within our budget. 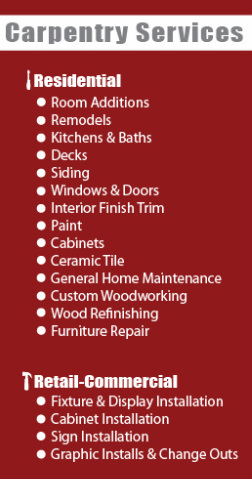 Carpentry Plus is the best value when it comes to your carpentry needs, hands down."